LG has announced that it will bring its much advertised Knock Code feature to some of its key smartphones this year. The new feature divides the smartphone screen into four different quadrants, and allows users to activate and unlock the phone by just tapping (or knocking) a preset code in these quadrants. 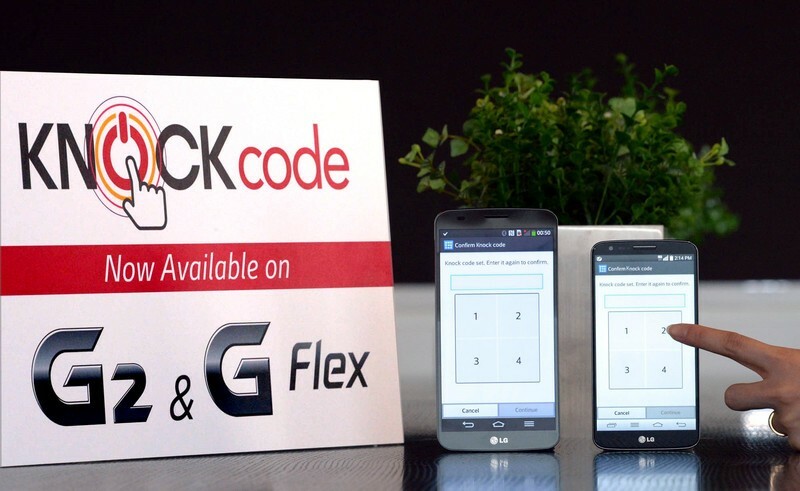 Knock Code, which was announced at MWC 2014, is an improved version of LG's Knock On feature, which debuted on the LG G2. According to the company, users can tap anywhere from two to eight times in the quadrants in a specific sequence. This yields 80,000 possible combinations to choose from, making it one of the most secure ways to unlock a device. The level of security provided by the new feature is far greater than other devices, "even those with fingerprint recognition systems", the company claims. What's more, you do not have to worry about hitting on the right spots, as Knock Code can approximate the pattern. It also minimizes the possibility of password theft, especially because the activity can be done without viewing the screen. The new feature is more responsive compared to bio-recognition systems, the company says. Besides G2 and G Flex, Knock Code will also be rolling out to the G Pro 2, G2 mini, F Series, and L Series III smartphones. The feature will be made available through a firmware update in April, though the exact details will be announced locally in the weeks ahead.